Beirut, Lebanon – A cover illustration of Prophet Muhammad in the latest edition of the French satirical newspaper Charlie Hebdo ignited controversy in the Middle East on Wednesday, prompting Egypt and Turkey to issue or threaten restrictions on publication of the images and stirring wide debate over religion and free speech. Some were outraged, while others called for free speech in countries like Saudi Arabia and Egypt that punish people for alleged blasphemy. Many expressed indifference, saying they were weary of debating cartoons that paled in significance beside the carnage taking place in wars in Syria, Iraq and elsewhere in the region. In Egypt, President Abdel Fattah el-Sisi issued a decree giving the prime minister authority to ban any foreign publications “offensive to religion,” the state-owned daily Al Ahram reported. Mr. Sisi has portrayed himself as a secular bulwark against Islamists. Egypt’s official religious institutions have had mixed reactions to the new cartoon. Protesters in Sidon , south Lebanon denounce the French satirical magazine Charlie Hebdo over it most recent issue showing the Muslim Prophet Mohammad on its cover. In Turkey, like Egypt a large and influential Muslim country, a local court in the southern city of Diyarbakir ordered the blocking of sections of four websites that showed the new cartoon, the semiofficial Anadolu news agency reported. The image depicts Muhammad weeping and holding a sign saying “I am Charlie” in French, the slogan adopted by many of those protesting the attack by Islamist extremists on the Charlie Hebdo headquarters, which killed 12 people. But one Turkish website, T24, translated the entire new issue of Charlie Hebdo into Turkish and those pages were still accessible Wednesday evening. 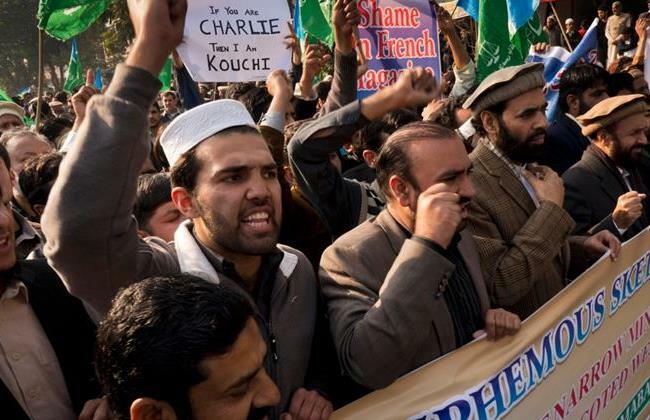 Supporters of Pakistani religious party Jamaat-i-Islami rally to protest French satirical magazine Charlie Hebdo in Islamabad, Pakistan, Jan. 16, 2015. In the early morning hours on Wednesday, the Turkish police halted trucks distributing Cumhuriyet, a left-wing newspaper that carried four pages from Charlie Hebdo’s new issue. Distribution resumed only after investigators checked the contents of the paper and concluded that none of the cartoons represented the prophet, Turkish news media reported. The newspaper received numerous threats over the phone and the Internet. Near the Cumhuriyet headquarters in central Istanbul, the police detained a protester who carried an Islamic flag, shouting, “You will not attack my religion, my prophet,” according to CNN Turk. Three more protesters were detained close to Cumhuriyet newspaper premises late Wednesday after they held signs carrying death threats against any one who insulted Islam and its prophet. “If you have limitless freedom of speech, Muslim community has limitless right to protest,” one handwritten sign read, a photograph posted on Twitter showed. Hezbollah, the Lebanese Shiite group whose leader, Hassan Nasrallah, last week criticized extremists who kill those they consider infidels in the name of Islam — without explicitly denouncing the Paris killings — released a statement Wednesday condemning the new cartoon. And that’s problem #1 … they never heard from ‘heaven’. But they sure do love ‘dialogue’. 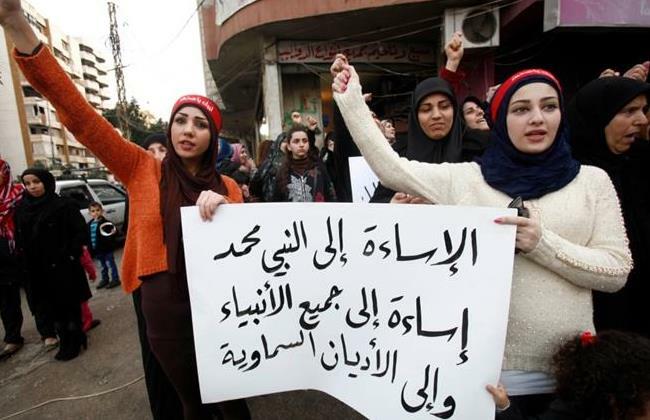 By the way, in the pictures, are those the same cuties who were protesting for women’s rights anywhere near Beirut last year?? Or for education in Pakistan?? Condemn and protest as much as you want. People can say whatever they want and will continue to. Condemn? They believe they’ll live forever. What better way to live than to spend one’s entire life policing the opinions of others and wasting your time in pointless protest & violence (pointless as in opinions happen, grow up). That’s how they keep them busy and united under tyranny. If all these people took all that effort and energy of protesting a cartoon, and dedicated it to helping the poor and underprivileged in their respective countries, how many people would they have helped today? I think the higher beings that they worship would be a lot more proud of them. errrr …. that’s a sort of Christian attitude I think … thumb up. Thanks for the thumb up, but I disagree that it is a Christian attitude. I think it’s agnostic to any religion, and is more about civilization. It’s about believing that we are all God’s creatures, and it’s our duty to look out for each other. If anything, Religion perverts this perspective into people thinking they should look out for “their own”. i don’t understand the west they say Muslims are welcome and don’t want any attacks on them yet the go around and poke fun at the prophet. It doesn’t make any sense and the west is playing into the hands of ISIS. this is exactly what Daesh want to incite the whole muslim world against the west and they can succeed if the this stupid charlie cartoons keep making fun of the Prophet.now in know in several muslim countries the gov’t make fun of Jesus and let their own people have fun with it. but are we going to be like them? are we that stupid and naive to fall into the hands of ISIS. you can be critical of their AMIR and the way they’re going about killing people. but to criticize the prophet abosuletely dumb founded and irrational. stop this non sense and embrace the moderate muslims and turn them against ISIS. that is your best chance of getting rid of extremism once and for all. or at least quiet it down..
NYT didn’t want to publish it..US and UK were more discreet.. Someday, when you have time, read ‘Islam Deconstructed’, lots of historical facts and information, pretty well documented. i will but the bottom line you are dealing mostly with ignorant people and educated people of Turkey and Iran were watching movies allowed by their gov’t to watch a movie that depicts Jesus as a womanizer and some other demeaning things i heard. Turkey and iran always the inciter and in the same class as ISIS. To me as a person who grew with Muslims friends its a sensitive issue and its not fair to demean the Prophet when you don’t want them to demean Jesus. but either way i should not stoop to the extremists view levels and fall for their trap. Personally, I don’t see anything wrong with using the words ‘pig’, ‘sausage’, or ‘bacon’. Especially for sausages which are all-beef. Good for them, that’s freedom of speech (stop laughing and let me finish). That just shows how the Muslim world really feels: The majority don’t care for the radical criminals, but they ALL will band together if one disrespects their prophet. I’m all in for freedom of speech, but one must also be respectful of others faith. I just wish, they protest with such passion against, the radical criminals that hijacked Islam and keep committing in human crimes against innocent other muslims. Those people have nothing to say to me. I’m glad not to be part of their world. Their opinions belong to them, and may they enjoy having them. 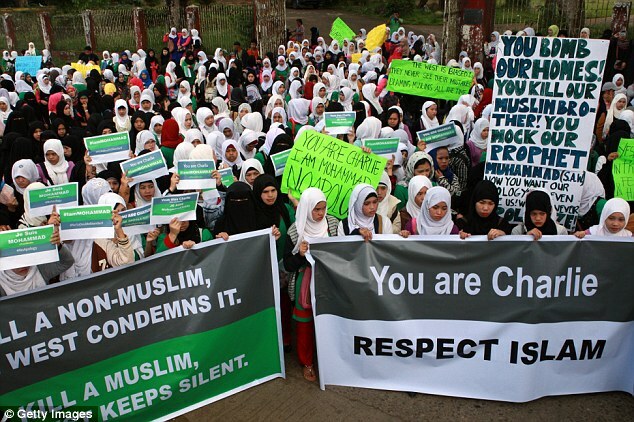 Ha, ‘respect islam’… I’ll repect islam when islam respects basic human rights. Absolute freedom of speech in a developing multi cultural nation may bring needless violence, harm to civilians, rancour and tragedies. Irresponsible authors and publishers disregard such tragic consequence. They want their name and wages regardless. The British had banned the Book Spy Catcher? Why? The same British did not allow the book titled the Massacre and also banned a film on Saudi Princess. Is it because Britain has a double standard one for the influential and one for the politically weak. Is Justice based on power and money. It is usual double standard, no principles, usual bullying of the weak and when the weak has no weapons to fight against. Is such a freedom more divine than communal harmony?